The WAKFlow system is a fusion of our gene analysis technology and xMAP® Technology of Luminex Corp. WAKFlow kits are easy to use and give results quickly. Results for 96 samples within 3 hrs from PCR to allele assignment. Included free-of-charge our own multifunction and user-friendly typing software. 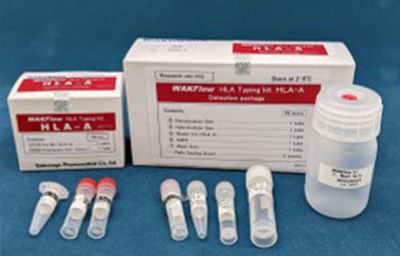 WAKFlow HLA Typing kits have been used for JMDP donor registration since 2005. Wakunaga Pharmaceutical Co., Ltd. All rights reserved.